April 19, 2013 by Verle L. Bell, M.D. 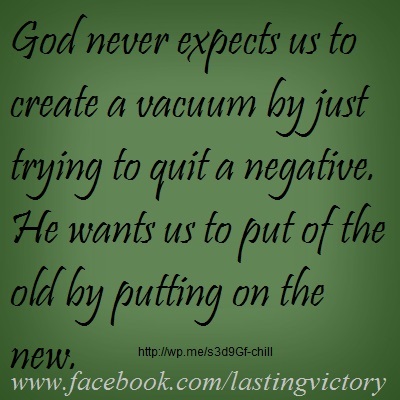 God never expects me to create a vacuum by just trying to quit a negative. He wants me to put of the old by putting on the new. So what would the opposite of worrying look like? LORD HELP ME TO CAST ALL MY WORRY ON YOU that’s what is reasonable. First I need to remember that I don’t have to react instantly. This would cause me to forget God and his part in the situation. In everything by prayer and supplication make my request to God. “Lord this is your problem not mine.” -instead I rush around doing things, fixing, trying. I need to let my request be known unto God. I rush off to bellyache to others or stuff it and keep it all in. If I am tense, I must be wanting comfort and function instead of closeness to my Lord and to avoid sin and become more like him. LORD HELP ME TO TAKE MY REQUESTS TO YOU AND TO TAKE A LOOK AT WHAT I WANT AND HELP ME TO WANT WHAT YOU WANT TO WILL WHAT YOU WILL. I revel in negative ruminations reviewing every detail of the evils of the past present and imagined future. LORD HELP ME TO TEAR MY THOUGHTS AWAY AND FOCUS ON PURE LOVELY JUST, HIGHLY REGARDED HONEST THINGS. I spend all my time and energy staring at the problem talking about it and coming up with whan can’t be done about it. LORD HELP ME TO DO THE LITTLE THAT I CAN AND LEAVE THE RESULTS TO YOU. I focus on how it will affect me not on the needs of others in the situation. LORD HELP ME TO BE FILLED WITH YOUR PERFECT LOVE FOR THE OTHERS INVOLVED SO THAT YOUR PERFECT LOVE WILL DRIVE OUT MY FEAR. This entry was posted in Uncategorized and tagged ATTITUDES of peace and power, casting out care, philipians 4. Bookmark the permalink. Wow! I really needed that! I think I’ll print it out and try to memorize those verses!